Proceedings from the NASA Administrator's Symposium: "Risk and Exploration: Earth, Sea and the Stars"
The goal of the Risk and Exploration Symposium is to engage in an open discussion about the issue of risk - identifying it, mitigating it, accepting it - all in the course of exploration. Yes, risk taking is inherently failure-prone. Otherwise, it would be called "sure-thing-taking." Challenge fosters excellence, often drawing on previously untapped skills and abilities. Each of us takes and accepts risk as a part of our daily existence. We often go out of our way to seek challenge. However, seeking challenge often means accepting a high level of risk. The dictionary defi nes risk as being exposed to hazard or danger. To accept risk is to accept possible loss or injury, even death. One of the key issues that continues to be debated in the tragedy of the Space Shuttle Columbia is the level of risk NASA accepted. And, ultimately, the entire nation is now engaged in a broader debate over whether or not the exploration of space is worth the risk of human life. While risk can often be reduced or controlled, there comes a point when the removal of all risk is either impossible or so impractical that it completely undermines the very nature of what NASA was created to do - to pioneer the future. Everyone today understands that human space exploration is a risky endeavor. However, the quest for discovery and knowledge, and the risks involved in overcoming seemingly insurmountable obstacles is not unique to NASA. Whether the challenge is exploring the depths of our oceans or reaching the top of our highest mountains, great feats usually involve great risk. During this symposium, we want to examine the similarities between space exploration and other terrestrial expeditions, and examine how society accepts risk. For example, more than 40,000 Americans die each year in automobile accidents. A recent study of 22,000 fatal accidents showed that nearly two-thirds of the victims were not wearing seatbelts - a clear indication that too many of us fail to understand the risks when we get behind the wheel of a car and fail to buckle up. Why are sacrifi ces made in the name of exploration more notable than the losses suffered in the course of everyday life? 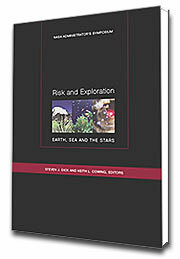 What lessons can be learned by studying the history of exploration and risk? And why are so many people willing to risk their lives to advance adventure, discovery, and science when, often, the benefi ts are unknown and indefi nable? We have assembled an invitation-only audience of participants for this important event comprised of NASA astronauts and leaders, as well as world renowned mountain climbers, deep sea explorers, cave explorers, Arctic and Antarctic researchers, scientists, communication experts, and others. These participants are involved, in a personal way, with risky endeavors, which serve to expand the frontiers of human knowledge beneath the sea, on the surface of Earth, and in outer space. We look forward to your participation in what we believe will be a spirited and highly benefi cial public discussion of risk and exploration. On behalf of Ames Research Center, one of your local hosts, I bid you greetings: to the Administrator, to my fellow Center Directors, distinguished guests from Headquarters, members of the NASA family. Our thoughts go out today to members of the Kennedy Space Center who cannot be here with us. They are attending to the damage from the hurricanes that have hit them recently. Greetings also to the rest of the distinguished guests here, and, of course, to our gracious hosts at the Naval Postgraduate School. We are here today to look at risk. How do we perceive risk, real and otherwise? How do we identify risk? How do we mitigate risk? And finally, when and how should we tolerate and accept risk? And all of this discussion, of course, is in the context of exploration, the essence of what we do. What is risk? In our daily lives, we all assume multiple levels of real risk. We get into cars. We get into airplanes, some of us far too often. We cross roads. We use cell phones while we're driving. We eat bacon and barbecued chicken that contain potentially carcinogenic nitrites. One way or another, all these things represent real risks that we tolerate and accept. Most of us mitigate these risks in some measure by doing things like wearing seatbelts, using the oversight of agencies like the FAA, remembering to look both ways, and getting our annual physical checkups. We are accustomed to living with risk, whether we realize it or not. Today, tomorrow, and Wednesday morning, we are going to explore risk in the field of exploration. There is monetary risk, programmatic risk, and, of course, the far more compelling issue of risk to life and limb of the explorers. We look at how we decide what risks are acceptable, both for the individual and the institution. I think this is a key element here. How do people perceive risk individually? How do we perceive risk as institutions? How do we collectively decide what we will accept? Let me give you a little bit of insight from my own experiences. I will start with a program from seven or eight years ago where I was fortunate to be the manager of the Lunar Prospector mission. In December 1997, just days before the launch, we had to make some very tough assessments of the risk. There was a single-string spacecraft, first use of a new launchpad, the maiden flight of a new launch vehicle, although it was a design based on some proven fleet ballistic missile motors. There was a very tight budget schedule, and a relatively young team, although with some key experienced people at the top. So, why did we go for launch? Why did we accept that risk? Well, we had a strong test program, solid teaming with effective communication and some very experienced key managers, open channels during the design and development process, and lots of insight from a "graybeard" committee that provided us with truly effective comments. In the end, the deciding factors amounted to a considerable degree of trust and the determination that we had done everything possible to ensure mission success. So, we launched. That mission was successful, and that data is now being used as we plan a return to the Moon in the not-too-distant future. Another example is from the restructuring of the Mars program. In April and June 2000, we had to decide whether to take the risk of going back to Mars for an opportunity that was just 38 months away. Would we not only send an orbiter, but would we send a lander? We had three opportunities there: do nothing, send an orbiter, and send a lander. Why did we take the risk of doing the most ambitious one? Well, it was an outstanding launch opportunity. We had solid heritage from the Pathfi nder Mission. We had a fully developed payload, and we had a robust entry, descent and landing scheme that was well understood. We put two rovers into the mission to balance the risk against random failures, and I think, as you will hear later on in this meeting from Steve Squyres, having 2 rovers had an unanticipated benefit of providing a rich panoply of hardware from which to reduce other types of risks. But, in the end, the reason we took that risk was because it was the right thing to do. A strategic plan brought us back to the surface of Mars and gained the kind of information that is now changing the textbooks, changing the way that we look at the Red Planet. Finally, let's look at the issue of human spacefl ight risk. I was honored to be the sole NASA representative on the Columbia Accident Investigation Board. It was one of the most diffi cult assignments that I have ever had in my career. In that entire seven months, we never lost sight once of the nine lives that were lost, the seven astronauts and the two searchers, the two helicopter pilots. Clearly, we take substantial risk when we put humans on the top of a rocket and leave Earth's gravity well. How do we adequately mitigate that risk? From Columbia, we learned some tough lessons. We learned we need to develop a culture of safety for the long haul. We need clear communication, clear organization, adequate resources, rigorous and sound engineering principles, and a program systems engineering approach that addresses the entire effort, that addresses all the analysis that we need. We also need to effectively learn to encourage alternative points of view. If we do all of these things, can we eliminate risk, especially for human spaceflight? I think not. Will we find a balance of well-mitigated risk and a powerful level of acceptable risk? I, for one, think so. What will that balance be? That's what we have come together to discuss today. The NASA History Division is pleased to present the record of a unique meeting on risk and exploration held under the auspices of the NASA Administrator, Sean O'Keefe, at the Naval Postgraduate School in Monterey, California, from September 26-29, 2004. The meeting was the brainchild of Keith Cowing and astronaut John Grunsfeld, NASA's chief scientist at the time. Its goals, stated in the letter of invitation published herein, were precipitated by the ongoing dialogue on risk and exploration in the wake of the Columbia Shuttle accident, the Hubble Space Telescope servicing question, and, in a broader sense, by the many NASA programs that inevitably involve a balance between risk and forward-looking exploration. The meeting, extraordinarily broad in scope and participant experience, offers insights on why we explore, how to balance risk and exploration, how different groups define and perceive risk differently, and the importance of exploration to a creative society. At NASA Headquarters, Bob Jacobs, Trish Pengra, and Joanna Adamus of NASA Public Affairs led the meeting's implementation. At NASA's Ames Research Center, Director Scott Hubbard coordinated a group including Rho Christensen, Danny Thompson, Shirley Berthold, Victoria Steiner, Ed Schilling, Mike Mewhinney, Kathleen Burton, and the Ames Video Team. Mel Averner also contributed significantly to the concept and content. The Naval Postgraduate School, commanded by Rear Admiral Patrick W. Dunne, provided a congenial venue. The meeting was broadcast on NASA TV, and thanks are due in this regard to Al Feinberg, Tony Stewart, Jim Taylor, and the planners' collaborative: Mark Shaddock and Spotlight Productions, Donovan Gates of Donovan Gates Production, and Michael Ditertay and his staff on this 30-person television crew. Thanks to their efforts, a DVD record of the meeting has also been produced. Thanks are also due to the moderators: Miles O'Brien of CNN, Chris McKay of NASA Ames, David Halpern of the White House Offi ce of Science and Technology Policy, and John Grunsfeld, NASA Headquarters. Finally, thanks are due in the NASA History Division to Liz Suckow and Steve Garber, and to the staff in the Printing and Design Office at NASA Headquarters: Shelley Kilmer, Cathy Wilson, Paula Kephart, Henry Spencer, Jeffrey McLean, Greg Treese, and Steve Johnson. In order to maintain the informal fl avor of the meetings, these proceedings are based on transcripts that have been lightly edited for grammar and punctuation. Most references to slides shown during the presentations have been deleted. (Washington, D.C.: NASA SP-2005-4701), pp. 294 + ix, hardcover, with some color photos. This is an engaging, highly readable edited proceedings of a symposium that the NASA Administrator sponsored in September 2004 that featured luminaries in exploration from a variety of fields such as mountain climbing, polar expeditions, cave diving, and underwater robotics. This topic of balancing the risks and rewards of exploration, especially in the context of space, continues to be a very relevant topic for historians, policymakers, and all those who follow NASA's activities. It is a very attractively laid-out volume with images, some color, for each section. How to order: Please contact the NASA Center for AeroSpace Information, 7121 Standard Drive, Hanover, MD 21076, 301-621-0390, help@sti.nasa.gov, Online Order Form: https://www.sti.nasa.gov/cgi-bin/ordersti.pl, Document ID # 20050192497. Title: Risk and Exploration. The price code is EA4 (Within U.S. $20; outside U.S. $40.00). Shipping and handling costs are additional and are as follows: Standard - U.S. only (UPS) - $2.00 per item; Federal Express: U.S. - $7.00/International - $17.00. This book also may be purchased from the NASA Information Center, NASA Headquarters, 300 E Street SW, Room 1H23, Washington, DC 20546-0001, (202) 358-0000. Order NASA SP-2005-4701.